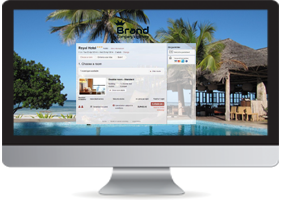 As hotelier, you now have the ability to manage all your booking environments from a single place. Our booking engine automatically adapts to your customer’s online environment such as desktop, tablet or mobile device. A quick access booking engine with dynamic display of your best available price on the selected date. Our smart booking engine has a range of features to cover all your needs: minimum stay, 3 nights for the price of 2, last-minute, breakfast included, etc. It also features advanced connection tracking tools so you can analyse the ROI of your online keyword campaigns and other marketing activities. Another advantage of our booking engine: a cancellation insurance on your website that will differentiate your offer from your competition. You can offer to your customers to pre-pay a reservation with flexible cancellation conditions. Clients can book a room with option that the hotel setup in the extranet. Once a booking is made, a confirmation notification can be sent via sms to the final customer. For the past five years, sub-Saharan Africa has reigned as the world’s fastest-growing mobile region, more than twice the global average (http://www.ibtimes.com/). With the ever increasing mobile traffic, ensuring mobile compatibility to your visitors is essential. Our mobile booking engine, provides seamless integration, while enabling you to achieve mobile conversion rates equivalent to that of your normal website. Automatically detects the platform that the visitor is using (PC, mobile, etc.) and displays the appropriate booking engine. 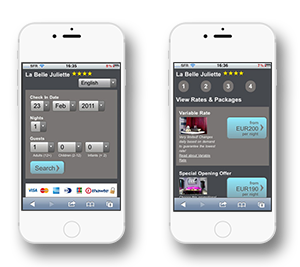 The user interface is kept as simple as possible, with a clear distinction between the website/mobile booking system. This allow the end user one action per screen and buttons specially designed for touch-screen interfaces. Enjoy the benefits of Facebook’s powerful recommendation features. With our Smart booking engine for Facebook, your fans will be able to view your hotel’s entire offer on Facebook, make a direct booking via the page and inform their friends about your hotel. Our booking engine integrates with your Facebook page and provide you with space to describe your hotel/services, advertise your rates and allow fans and visitors to book direct. You Facebook fans will be able to book a room, submit a review of their stay and recommend your hotel to their friends, all in one place: your Facebook page.